​​​ TOMBALL – Additional Augusta Woods Village tenants have begun to open as Phase I reaches completion. Located at the southeast corner of Kuykendahl Rd. 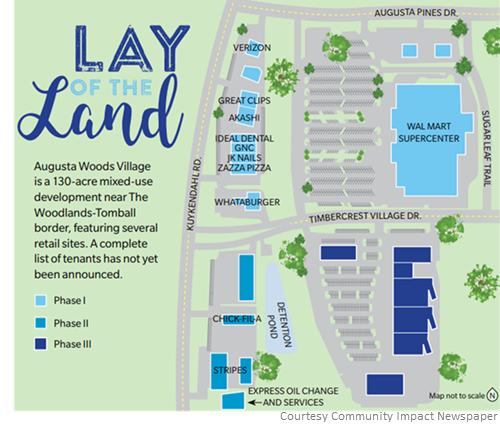 and Augusta Pines Dr., Augusta Woods Village is a 130-acre mixed-use development with retail, residential, and medical sites. The retail component includes pad sites, multi-tenant buildings, and big box sites for lease. Phase I construction, which includes a strip of retail buildings in front of the Walmart Supercenter, is 100 percent leased. ​Find this article on page 13 of Tomball | Magnolia Edition, Volume 8, Issue 6, March 7–April 4, 2018 of Community Impact.